… he is remembered as the principal employer of … Joseph Haydn. 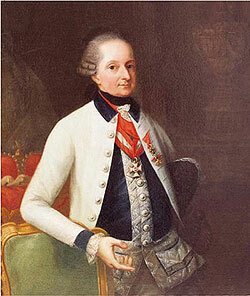 Nikolaus I, Prince Eszterházy died on the 28th September, 1790. He had inherited both his princely title and Haydn from his brother, Paul, in 1762; and, after a rather wobbly start, the newly elevated prince and his capellmeister settled down to what was to become a pretty unique patron/composer relationship. There is, though, a little mystery: it’s easy to understand the nigh on 200 pieces that Haydn wrote which included a baryton(?? *) (the prince’s chosen instrument) in the ensemble, and it’s a bit of reasonably straightforward logic to arrive at the symphonies and the operas – the prince, after all, employed an orchestra and had an opera house (and puppet theatre) at Eszterháza – but what about the 43 or so string quartets that Haydn wrote during his 28 years of service to Prince Nikolaus? There’s no record of the prince showing the slightest interest in either the string quartet as an ensemble or in promoting performances of these masterworks by his internationally famous servant. Puzzling. In the year of the death of his patron, Haydn wrote a third set of quartets (op. 64) for the violinist, Johann Tost (they include the famous ‘Lark’ Quartet). He followed this three years later by the op. 71 set, dedicated to a relative of the Eszterházy’s, Count Anton Georg Apponyi. This entry was posted in Chamber music, String Quartet and tagged Haydn, Opp 64 & 71, string quartet, The Lark. Bookmark the permalink.